Robert Rowand Anderson was born on the 5th April 1835 in Edinburgh. Despite initially following his father into legal practice, he started studying architecture at the Trustees Academy in 1849 before starting as an assistant for George Gilbert Scott in Trafalgar Square, London. He has been described as ‘The Premier Architect of Scotland’, designing numerous striking and imposing public buildings. He was even commissioned by King Edward to modify Balmoral Castle. He was widely recognised by his peers of the era as a distinguished and truly talented architect. He returned to Edinburgh in 1860 where his skill and flair earned him invitations to compete for prestigious tenders, for example the University of Edinburgh’s graduation hall and medical school in September 1874; a competition in which he was to ultimately succeed. 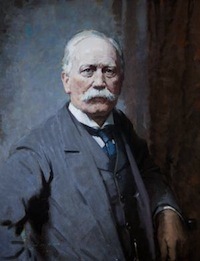 His most prominent work includes: Holyrood Abbey in 1877; Mount Stuart for the 3rd Marques of Bute in 1878; National Portrait Gallery and Museum of Antiquities, Edinburgh 1884; Glencoe House in 1895; North British Railway hotel in 1895 now known as the Balmoral Hotel, Edinburgh and the Royal residence of Balmoral Castle in 1902. He was awarded many honours, most notably a Knighthood in 1902 and in 1916 he was presented the Royal Gold Medal, which was the highest accolade from the Royal Institute of British Architects.